A is 1 3/5 times quicker than B. 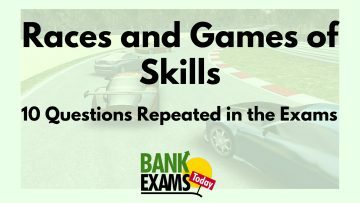 If A gives B a start of 75 metres, Find the length of racecourse so that both to them reach the winning post at the same time. Ans 1. Let the length of racecourse be I m.
.. In a time in which A covers I m, B covers (I - 75)m.
Ans 2. When A scores 80 points B scores 64 points. Hint: In 20 seconds Q runs = 100/25x 20 m.
Hint: When Q runs ( 2000- 200) m , R runs ( 2000 - 560) m.
A runs 1.5 times as fast as B can. 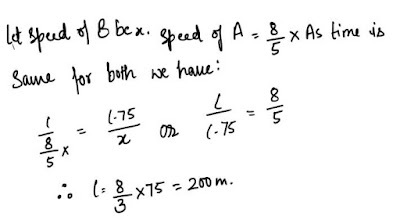 If A gives B a start of 50 m, how far must the winning post be in order that A and reach at the same time? P and Q run a kilometre and P wins by 1 minute .P and R run a kilometer and P wins by 375 m. Q and R run a kilometre and Q wins by 30 seconds. Find the time taken by each runner to run a kilometre. (a) 150 sec, 210 sec, 240 sec. (b) 120 sec, 160 sec, 230 sec. (c) 100 sec, 160 sec, 190 sec. (d) 140 sec, 200 sec, 230 sec. Ans 6.150 sec, 210 sec, 240 sec. 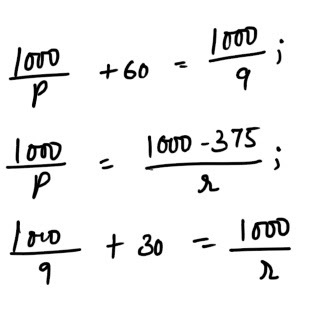 Hint: Let the speed of P,Q and R be p,q and r ms respectively. A can give B 25 points, A can give C 40 points and B can give C 20 points . How many points make the game? Hint: Let the game be of x points. When A scores x points, B scores x- 25 points, and C scores x - 40 points. At a game of billiards, A can give B 12 points in a game of 40 and A can give C 10 points in a game of 50.How many points can C give B in a game of 80 ? Hint: When A scores 40 points, B scores (40-12) points. When A scores 50 points, C scores (50- 10) points.